Those in Japan get the Corolla Fielder as a wagon; Americans get the Toyota Matrix (or Pontiac Vibe if they swing that way.) Now officially the Corolla Matrix, the wagon naturally shares the Corolla powertrain, but has a more SUV-like appearance and a hatchback, and a higher price. Development of the 2009 Matrix focused on more coupe-like styling with better interior utility and performance. It is wider with a lower stance. From the rear, the Matrix has rounded rear windows and continuous character lines that run from the front grille to the A-pillar. The 2009 Toyota Matrix is available in three grades – Standard, S and the XRS - with optional all-wheel drive (AWD) in the S grade. S and XRS models have a front underbody spoiler with a large mesh fog lamp bezel and rear underbody spoiler. A rear deck spoiler is standard for all XRS models. To make the appearance sportier, the car was lowered by half an inch, the greenhouse was narrowed, the C-pillar was made more substantial, and the tires were pushed out to make the car look more “hunkered down” (pushing the tires out also increased stability). The 2009 Matrix Standard starts at US$16,850 with the S coming in at $18,920 and XRS at US$21,320 (including destination). 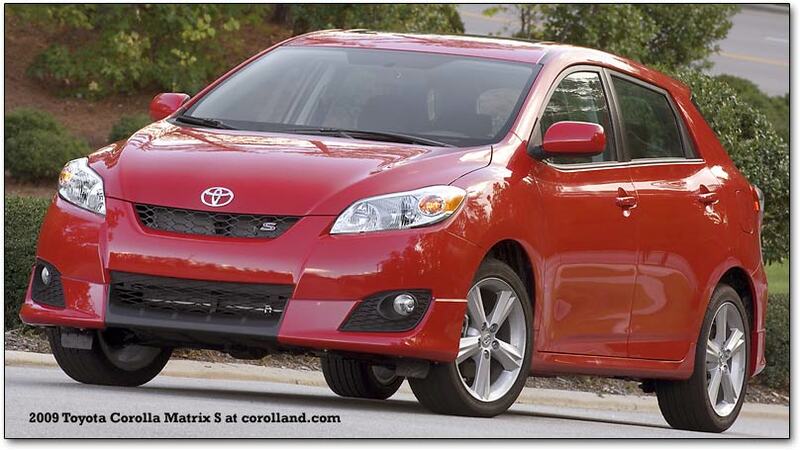 There is no doubt that the Matrix is sportier-looking in this generation, as the Corolla is; it also looks far larger, having moved from “wagon” to “tall wagon” status, meeting less successful vehicles (like the Dodge Caliber) along with many relatively successful vehicles there. The front end is fairly bulbous, with brow-like bulges on the hood coming out over the headlights. Inside, there is a more spacious feel with a taller roof; however, acres of thick, dull metallic plastic and clumsy-feeling HVAC controls suggest that the money for the extra space and new features had to come from somewhere. The gauge cluster is oddly designed and somewhat distracting with overly thick divisions; seats are moderately stiff. New sport seats accommodate the vehicle’s new lower profile while maintaining the expected high comfort levels, and were lowered slightly to maintain appropriate headroom. A new three-spoke steering wheel is used; XRS models come with a leather-trimmed steering wheel that also includes spoke-mounted audio controls and hands-free Bluetooth® capability when equipped. A fold-down seatback table will be available for the front passenger’s seat, with a movable and removable cup support element for the front center console. Dual-stage SRS airbags will be standard for the driver and front passenger. Front seat-mounted side airbags, two-row side curtain airbags and front active headrests are also standard. For rear-seat passengers, expanded front-to-back couple distance helps to provide additional room and comfort. A folding seat with a 60/40 split includes a middle-seat headrest for the fifth passenger. New air conditioning with larger vents for has lower power consumption but better heating and cooling. A new 1.8 liter engine with variable valve timing on both intake and exhaust produces 132 hp and 128 lb-ft of torque, with estimated 2008-standard 26/32 city/highway mpg for manual transmission models and 25/31 for automatics. 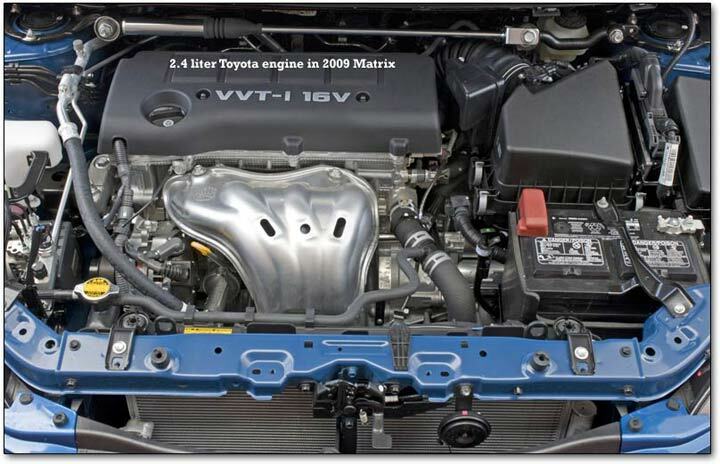 The 158 hp (162 lb-ft) 2.4 liter DOHC engine with VVT-i is estimated to get 21/29 with the five-speed automatic. The 2.4’s mileage is actually quite good when compared with the Mazda3, Caliber, or similar cars, and it provides more “grunt” than the 170 horsepower engine used in the past Matrix and Corolla XRS. The Matrix’s base wheel is a 16-inch steel unit with a six-spoke full wheel cover. A 17-inch five-spoke aluminum wheel will be available for the S grade, and an 18-inch aluminum alloy wheel with a twin five-spoke design will come standard on the XRS grade. The front suspension uses MacPherson struts as in the past; in the rear, either a torsion beam rear suspension or a double-wishbone setup is used, depending on the model (with S and XRS getting the double wishbones). The torsion beam helps to make the ride smoother, while the double wishbone setup increases agility. Brake performance will be improved with standard front and rear disc brakes on all Matrix grades. Anti-lock brakes (ABS) with Electronic Brake Distribution (EBD) are also standard. Vehicle Stability Control (VSC) with TRAC and off switch will be standard on XRS and available as an option on all other models. VSC automatically adjusts engine output and the vehicle’s braking force at each wheel when the vehicle experiences a loss of traction during cornering. All wheel drive is now handled electronically, as on the RAV4, rather than with a fluid link. Form, fun and functionality will be in abundance with an array of standard convenience features across all three grades. 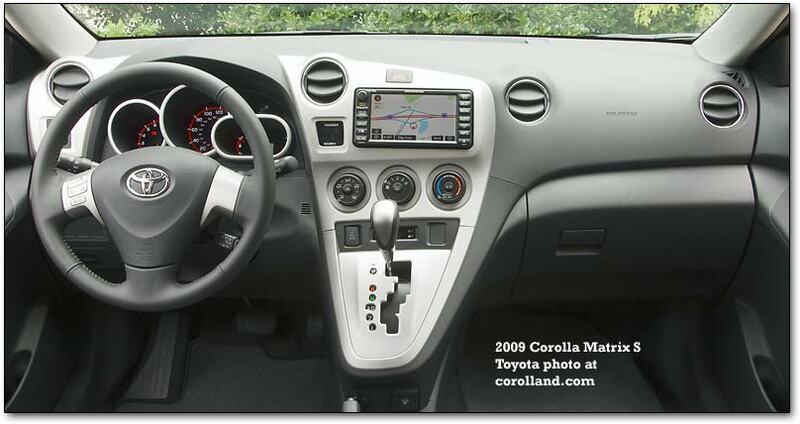 Base equipment on all Matrix models include power color-keyed outside rearview mirrors, power steering, tilt and telescopic steering wheel, daytime running lights, heavy duty rear window defogger, intermittent windshield wipers, 12-volt power outlet, four cupholders, auxiliary audio input jack, front center console box and an engine immobilizer. The front passenger seat folds flat, and various hooks and tie-down rings are placed at strategic locations. The S grade adds standard power door locks and windows with one-touch down driver-side, 115-volt power outlet, cruise control, intermittent rear window wiper, fold-flat front passenger seat, remote keyless entry, AM/FM/CD with MP3 capability and six speakers, front and rear underbody spoilers and fog lamps. In addition to these features, the XRS grade features standard P215/45 R18 tires on 18-inch alloy wheels, sport strut tower brace, VSC with TRAC and off switch, and a three-spoke leather-trimmed steering wheel with audio steering wheel controls. In addition to the array of standard equipment, an impressive list of optional comfort and utility features are available to further enhance the Matrix driving experience. Available options will include an AM/FM/CD with six-speaker system with DVD navigation with XM NavTraffic® capability, alloy wheels, power heated outside rearview mirror, intermittent rear window wiper, cruise control, power door locks, power windows, and remote keyless entry. The Matrix will hit American Toyota dealerships in February 2008.